Thought to be dead an astronaut botanist has to live in the dangerous conditions of Mars, relying on his ingenuity to survive until the next mission arrives. Matt Damon doesn’t understand why he was reduced to only saying his name in Team America, maybe it’s because the film-makers were being ironic, never more so in The Martian is this highlighted. 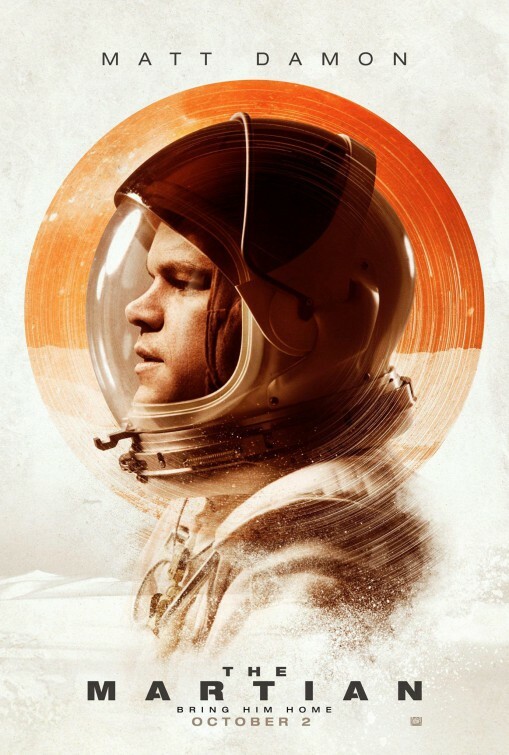 Under director Ridley Scott’s auteur eye Damon shines here as Watney in Drew Goddard’s adaptation of Andy Weir’s novel. It’s tense, humorous and visually rich including planets, Martian landscapes, space crafts and NASA control rooms. It’s also smart and thrillingly realistic as they plan rescue attempts and Damon hones Robinson Crusoe on Mars, Grativy, Apollo 13 and the like. The sets, props, costumes and special effects CGI for the most part are excellent the locations both on Earth and the red planet really sell it. The acting aided by Goddard’s first-rate script. Both Jeff Daniels and Kristen Wiig are notable here in serious roles. Memorable are Sean Bean as Mitch – a mission director, Benedict Wong plays Bruce Ng an engineer of the rockets for the rescue mission and Chiwetel Ejiofor is Vincent, a director and the first person to establish contact with Watney. There plenty of disco tracks as that’s all Watney has to listen to, but Harry Gregson-Williams’ Martian score is solid. Watney’s uses all his skills an intellect, stapling a wound, he rations food and grows his own in seemingly impossible conditions and uses different NASA equipment to aid him. Damon’s Watney at times is very witty and you warm to dryness and invest in his survival, rooting for him in his highs and lows. Back on Earth Scott offers digestible politics and PR but there’s a positive aspect with countries, individuals and departments working together with each other. Goddard and Weir’s offering doesn’t contain any sci-fi metaphysical and/or horror tropes with The Martians realism and by default Scott remains focused on a humane elements and visual effects never delving into what made him a household name. It’s about human beings tackling problems and the exploration of Mars’ barren environment and like similar space disaster movies there’s plenty of emotion, even with its long running time it moves along at pace. Overall, if red planet sandstorms, potato growing and space travel is your thing, it’s a must.